Heavy Vinyls, includes Limited Edition Free Mysterons 50x70cm Poster. 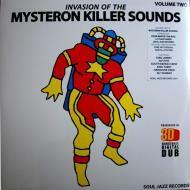 3D Dancehall Digital Dub compiled by Kevin Martin (The Bug) & Stuart Baker (Soul Jazz Records). Spacey Dubs inside!